Electro Kinetic Technologies completed a semi-custom solution for a national institution with multiple, multi-level facilities across the country. However, the final product we designed has applications for restocking vending machines in any large company headquarters, healthcare facility, campus, stadium, government building or complex. The customer has multiple locations of vending machines for snacks and beverages available on each floor of their institutions nation-wide, and prefers to service their own vending machines to better accommodate their business and logistics models. 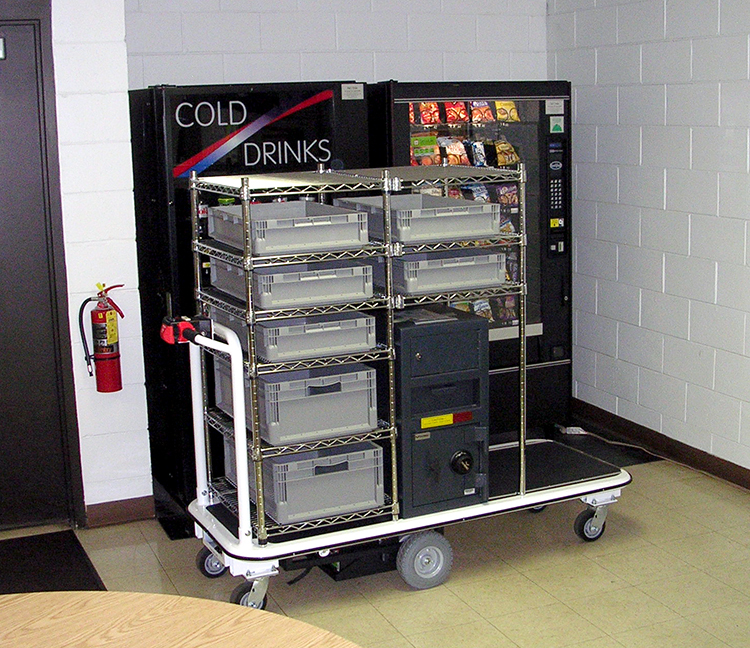 Restocking the vending machines posed safety risks to facility staff due to theft risk and the repeated push-pull forces used in navigating the institution with vending machine supplies, necessitating a more secure ergonomic means of transport. An adequate solution would have to fulfill two basic functions: 1.) the storage and transport of snack foods and beverages of varying weights and package sizes, and 2.) the secure storage and transport of cash with space available for both change and bank bags. In addition to those basic functions, the final product would have to be capable of safely carrying heavy loads to increase efficiency of restocking, as well as navigate some modest ramps. Electro Kinetic Technologies fulfilled each of the desired functions by starting with a standard 1031-L motorized cart as the basis for the solution. Modifying an existing standard model allowed us to keep costs lower for the customer and shorten turnaround time. The 1031-L model was ideal for its ease of operation, durable industrial design, strong warranty, and low-maintenance foam-filled tires. The motorized functionality also eliminates push-pull forces on the operator, therefore reducing the potential for musculoskeletal injury. In order to accommodate the storage and transport of packaged snack foods, Electro Kinetic Technologies added five 24” L x 15” W x 5” H, and two 24” L x 15” W x 9” H lightweight totes for organization. Adjustable, lipped shelves were configured to retain the totes with room enough for easy storage and retrieval of supplies. The top of the shelving unit was left open and could be used for additional storage. Each shelf could be adjusted as needed in 1 inch increments. For beverage storage and transport, part of the deck area was left open for easy loading and unloading of beverage supplies. The cart’s deck was constructed with anti-slip laminate and a lip around the beverage area to keep beverage totes or packages from jostling or sliding off the cart. Adjustable elastic straps provided further security for beverages, especially when stacked. Secure storage and transport of cash reserves and bank bags required a safe bolted onto the deck of the motorized cart. The selected safe was built for bank bag storage, with a mailbox-style deposit and interior dimensions of 10-1/4” H x 13-3/4” D x 11” W. A keyed storage area on the top of the safe was included to make the cash used for change readily available, with interior dimensions of 6-7/8” H x 13-3/4” D x 12-3/8” W. Each of the safe’s features minimized the possibility of the cart operator becoming a theft target and allowed for more adequate and organized storage of cash.